Trig TT22 Mode S (1090ES ADS-B Out) transponder – Trig’s compact high performer unit is easy to install and with it's high power output of 250W this makes it suitable for high altitude or high performance aircraft. The TT22 is a class 1 transponder - it meets TSO C166b the latest standard for ADS-B out in the U.S. It’s an ideal component for your ADS-B Out ‘mandate ready’ solution. NOTE ON U.S. COMPLIANCE: Currently the FAA ADS-B requirements specify the higher power Class 1 transponder. For U.S. customers, we recommend only the Class 1 TT22 unit..
Trig TT31 Mode S (1090ES ADS-B Out) transponder – ‘Plug and play’ retro-fit to the popular KT76A and KT78A. This makes it the easiest replacement option for your old Bendix King unit. However the TT31 also offers class leading performance. The TT31 has the lowest power consumption in its class, yet delivers a nominal 240W power output. The transponder has a clear bright display and has a highly functional and easy to use interface. 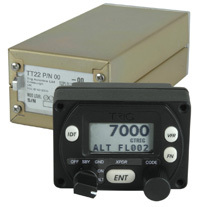 If you already own a suitable Trig transponder then our TN70 kit is the easiest way to meet the mandate. The TN70 includes a certified WAAS GPS and companion WAAS GPS antenna, designed to enhance your aircraft via a simple install that will deliver excellent ADS-B Out performance. If you need a Trig transponder to complete your TN70 ADS-B solution, then simply add one of our class leading products certified to FAA TSO C166b, the latest ADS-B standard. 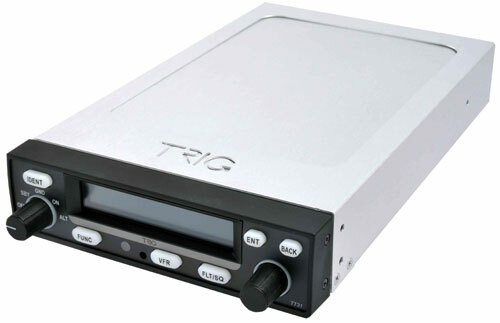 TY91 and TY92 VHF radios – Trig’s TY91 certified 25 and 8.33 kHz radios take up minimal space and weight. Designed with a compact control head and separate radio hardware unit the radio can fit into the tightest panel space. Simple to operate and with a crisp display visible in all lighting conditions the radios features include; dual watch, 9 programmable memories, in- built speaker amplifier and a two place intercom. 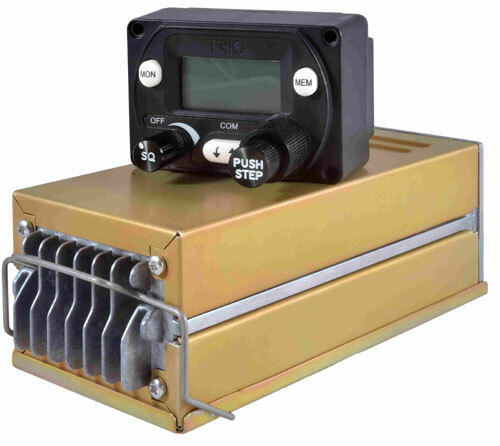 The TY92 is a higher powered 16 watt version suitable for use as a standby radio on heavier 28 volt GA aircraft. 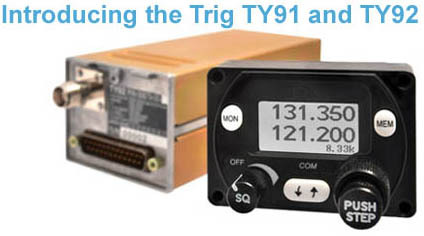 The TY91 and TY92 are the perfect complement to our TT21 and TT22 transponders. TY91 is 12 volt 6 watt unit, TY92 is 28 volt 16 watt unit.